German scientists at Potsdam's Fraunhofer Institute for Applied Polymer Research have just developed a novel pair of plasma-coated contacts. Thanks to plasma's natural antibacterial properties, these new lenses could potentially cure common eye infections like keratitis. Led by Fraunhofer Institute's Dr. Joachim Storsberg, the research team decided to make these lenses out of silicone hydrogel and saturate them in plasma-water. Interestingly, researchers found that silicone hydrogel absorbs plasma well while still retaining its flexible shape. Plasma has already been used successfully for years in the treatment of various skin conditions. Scientists believe the same germicidal properties that work so well on the skin could be effective in the eyes. To support their project, scientists at Fraunhofer Institute pointed to a number of well-controlled studies that demonstrated how plasma-enhanced contacts could safely ward off bacteria on the human eye. Most of these peer-reviewed studies tested plasma lenses on donated human corneas. There's no word yet when these plasma-enhanced lenses will be made available to the public. According to global health experts, about one in four cases of sight loss are directly related to corneal opacity. Most cases of corneal opacity are caused by bacterial infections like microbial keratitis. Bacterial keratitis is a disease that affects a person's cornea and can cause blindness if left untreated. Early warning signs of keratitis include itchy eyes, red eyes, and eye discharge. If it's caught early enough, doctors can prescribe steroid drops or a round of antibiotics. In serious cases, keratitis patients may require a cataract transplant. Unsurprisingly, contact lens wearers are at a higher risk of developing bacterial eye infections, especially if they have poor hygiene. 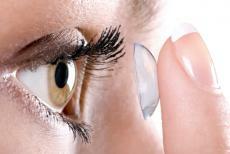 Contact lens wearers should never keep their contacts on while sleeping, swim with contacts on, or wash contacts with water. Eye health experts prefer daily disposable lenses because they dramatically reduce a person's the risk of catching a bacterial infection.